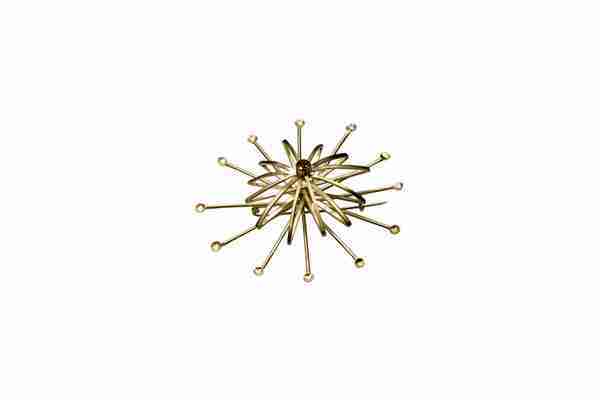 This is a stunning stand out of the crowd, brooch. The inspiration comes from a visit to the Natural History Museum in London. This is a limited edition piece which is made to order and takes between three to four weeks to make and dispatch. The brooch is made in ethical silver which is luxuriously gold plated has a sparkling berry red garnet at the center. Would you like to make an inquiry? You can contact farah@farahqureshi.co.uk for further information. 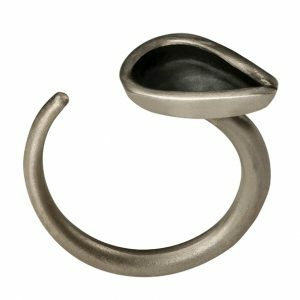 This stylish and limited edition ring is made in ethical sterling silver and is inspired by botanical imagery. The center is oxidized to the shade of jet, for an element of contast. 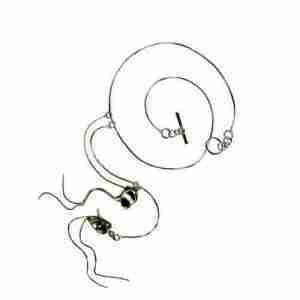 The ring takes between three to four weeks to make and dispatch. Would you like to make an inquiry? You can contact farah@farahqureshi.co.uk for further information. 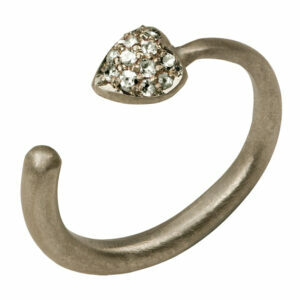 This contemporary stunning, limited edition ring is made in ethical sterling silver which is luxuriously gold plated. The curvy design is a development from a collection called twirl and has glistening gems which include buttercup yellow citrine, grape coloured amethyst and sparkling, subtle diamonds studded around the edge of the setting. The ring is made to order and can take between three to four weeks to make and send. Would you like to make an inquiry? You can contact farah@farahqureshi.co.uk for further information. 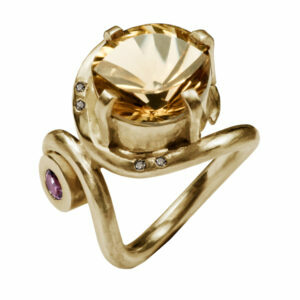 This elegant and stylish ring is made with ethical white eighteen carat gold and is inspired by botany. it is embellished with shimmering jet coloured diamonds and sparkling grape coloured amethyst gems that have been micro pave set. The design takes between three to four weeks to make. The width of the ring is 2mm at the widest point and can also be made in a larger thickness, there is a price difference if made in a thicker gage of metal. Would you like to make an inquiry? You can contact farah@farahqureshi.co.uk for further information. This is a exquisite piece of jewellery inspired by botany. 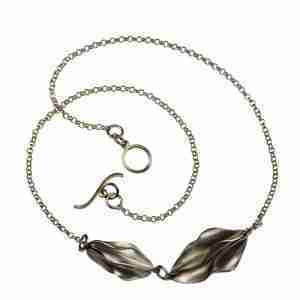 The floral necklace is made in ethical sterling silver. 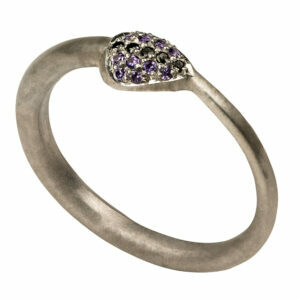 Its a eye catching piece which can be worn during the day and evening. Would you like to make an inquiry? You can contact farah@farahqureshi.co.uk for further information. Delivery times are between three to four weeks. 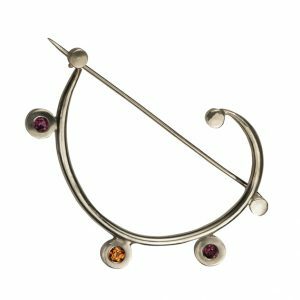 This is a piece which is both fun and versatile, the elegant curvy brooch is made in polished ethical silver with sparkling sun orange and candy pink garnets. The brooch is both great for day wear and for the evening. Would you like to make an inquiry, you can contact farah@farahqureshi.co.uk for further information. 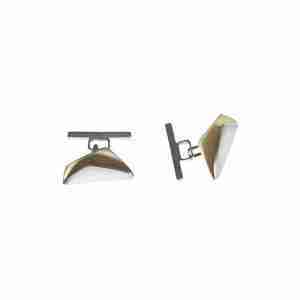 Please note that all jewellery is currently made to order and takes a few weeks to make and send.